The first sign that something is wrong with a roof is usually a damp patch on the ceiling below. 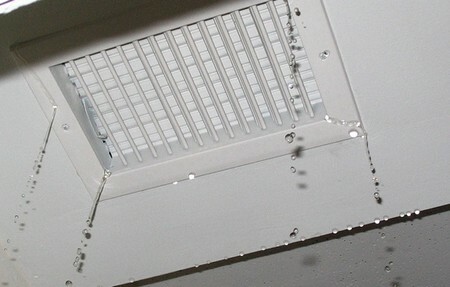 Do not assume that the damp patch is directly below the roof defect – water may have travelled along the roofing felt before finding a way through or may have travelled along the underside of the roof before dripping off a rafter. To find out what the problem is, look at the outside of the roof for obvious signs of damage like slipping or missing slates or tiles. Then look more carefully (bin­oculars will help) for broken or cracked ones. The problem may be the ridge or hip tiles and the mortar between them. If you cannot sec anything wrong, the flash­ings or valleys may be at fault. Slates usually slip because the nails holding them have corroded and can no longer support the weight of the slate. Sometimes it is possible carefully to case the slate back to its proper position. You may be able to do this from inside the loft space by drilling a small hole near the top of the slate and then wiring it to an adjoining batten. Or you can slip a strip of lead, copper or zinc (called a tin­gle) underneath the slate and feed it under the slate to appear above a batten. Then fold this end of the tingle down over the batten and the other end up over the slate. If one slate is loose, others may also be about to slip check this by gently tug­ging any suspect ones. It can be quite difficult to tell whether a slate is leaking because of damage or deterioration isolated small pieces missing from corners are not a serious problem, but large pieces missing, cracks, splits or flaking due to deterioration with age can let in water. Cracked or split slates can be repaired temporarily by scaling the break with a mastic. But the only permanent cure is to replace the defective slate. This can be a fiddly job since it is not usually possible to gain access to the nail securing the slate. The best way to remove the slate is by pushing a slate ripper under the slate, hooking it over the nail and then giving it a sharp jerk to break the nail. The faulty slate should then be eased out carefully. The new slate is held in place using a tin­gle measuring about 230 x 25mm nailed to a batten between the exposed slates. Slide the new slate into place and bend the tingle up around the slate to fix it in position. Loose tiles High winds may dislodge tiles, or the nibs which hook over the battens may be damaged and no longer able to hold the tile in place. If the tile has simply been dislodged, it can be carefully pushed back into position so that the nibs hook over the batten. It may be necessary to lift the adjacent tiles slightly to ease movement. But if the nibs are broken, the tile will have to be replaced or wired in place like a slate. To get the old tile out, wedge up adjacent tiles so that you can slip whatever nibs remain over the batten. If the old tile is nailed, rock it from side to side or, if necessary, use a slate ripper to get it out. Fitting new tiles is usually fairly easy work from the eaves upwards when titling more than one and use 30mm nails to secure them. If you notice any flaking tiles while you are on the roof, replace these too. Carefully prise the loose tiles free and scrape away all remaining loose and crumbly mortar. Replace the ridge tiles on to a bed of weak mortar – one part cement, three parts of soft sand plus a plasticiser added to the water. If you use a mix which is too strong, it will be stronger than the tile and if movement occurs the tile will crack rather than the mortar. 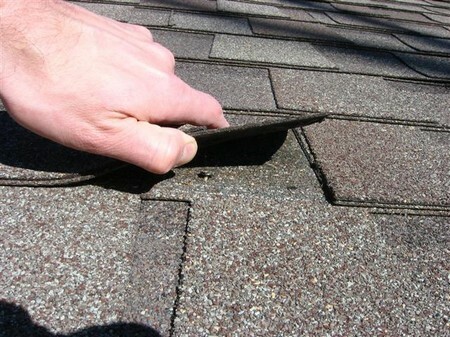 Loose shingles can be slip­ped back into position and carefully nailed into place. If there is a general deterioration of the shingles (rot, for example) the only real cure is to replace them. When re-covering with anything other than shingles, consider the struc­tural implications carefully tiles are much heavier than shingles and the roof may not be able to cope with a higher loading. With older slates and tiles, it can quite often be diffi­cult to get exact replacements. Try local demolition firms and architectural salvage yards.